Recently at CES 2018 the most surprising and impressive unveiling belonged to Byton, a Chinese-based company with offices in Europe and the United States. There are 5 things Byton has that Tesla doesn't have and it would be good if Tesla at least thought about them. When Byton concept was introduced it has some very cool features that people say would be great if Tesla would have them too. Bigger screen, rotating seats, facial recognition, hand gesture control and smart watch customization are all cool features Byton has and Tesla doesn't have. Let's talk about them below. Car companies that come to CES are focusing on user experience. Byton has a screen that is a meter long. It is ranging from the driver's seat to the passenger seat. Imagine a screen that is almost 3.3 feet wide. That would certainly give the Tesla owners a much better user experience. Recently when I saw the image of GM's fully autonomous car concept without a steering wheel, I though "why not change the interior design?" Indeed. If an autonomous car is going to work the way it's designed to work then we don't need the way the seats are lined up in the interior. Seats should rotate to create more comfort. That's what Byton's seat do. You can push a button and the seats move 12 degrees. You can easily talk to people who sit in the rear seat. Most new cars these days use a key fob. But what if that can be replaced by facial recognition? It would be great if Tesla cars or any other cars could use recognition. Byton does that too. Apparently Byton is planning to have a facial recognition for each seat. What if you could control your screen by remotely swiping your fingers over it. 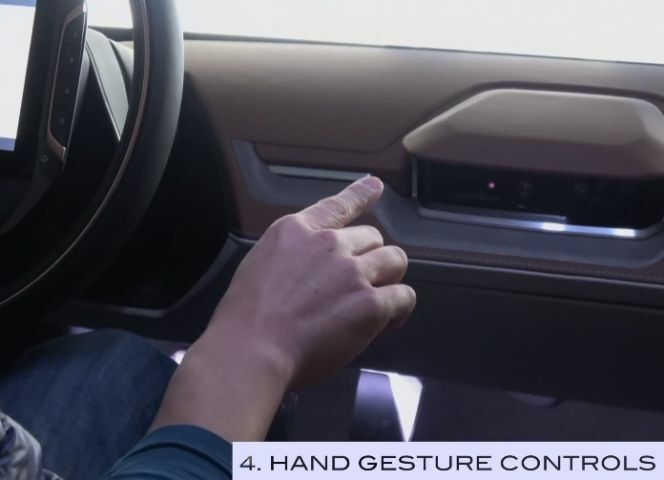 In the future Byton wants to connect the hand gesture control to smart watch so that when the driver enters the car the system can throw your vitals up on the screen. Here is a good video comparing these 5 things that Byton has and Tesla doesn't have. These are some good features and it would be good to see them in Teslas, Nissan Leafs and Chevy Bolts as well. As comparable electric cars enter the marketplace Tesla will have to make changes to stay ahead or on par with them. This will help to accelerate electric car adaption. I love these features, but am not sure about the Smart Watch Customization. "Why does anyone need a car that knows how long you slept the night before? Just more to go wrong. I don't want Alexa in my home, let alone my car. And seats that rotate 12 degrees?? Is that actually something people want? Are the engineers on crack?" asks Steve Blair in Tesla Model 3 Owners group on Facebook. Having said this, Byton is not a mass production car yet. It's just a showroom car for now. But that can change soon. Would you like to see Tesla Model S, Model 3 and Model X having these features as well? Please let us know why in the comments sections below for discussion. Also see our full coverage of CES discussing the electric car future at CES. Tesla is already ahead of Byton. Tesla has built several production cars. But Byton can move quickly if they get the 2nd round and build the factory in China. Most of the engineering of Byton is done in Germany by ex BMW guys and they currently hire 200+ people in their California R&D centre!